I find bread to be super comforting. So, let’s split a piece of warm bread right out of the oven ok? We can talk at the kitchen table. Let’s feel our feelings while snacking. Let’s turn off the heat and turn on the oven. The truth is, I’ll always want the biggest breadstick if out dining out. I’ll probably want to eat your corn bread right off your plate. I might make two pieces of toast for breakfast followed by one more for dessert. I’m moving to carbville right next door to the cheese island. I’m saying all of this to say that this bread is awesome. It’s easily savory or sweet. It’d be perfect for a grilled cheese and equally perfect for jam. It has subtle pumpkin spice flavor, and should probably be coming out of your oven soon. Believe me, it’s as tasty as it is pretty. In a large bowl or the bowl of your stand mixer, stir yeast into water to soften with a pinch of sugar. Stir until yeast is dissolved. Add milk, eggs, pumpkin, oil, 4 cups of flour, brown sugar, salt, cinnamon, ginger, nutmeg and cloves. Beat on medium high for 2 minutes. Gradually add remaining 2 1/2 cups of flour, a little at a time, until you have a dough stiff enough to knead. Either turn dough out onto a generously floured surface and knead, adding flour as necessary until you have a smooth, elastic dough. Or using your dough hook knead until pliable and smooth. 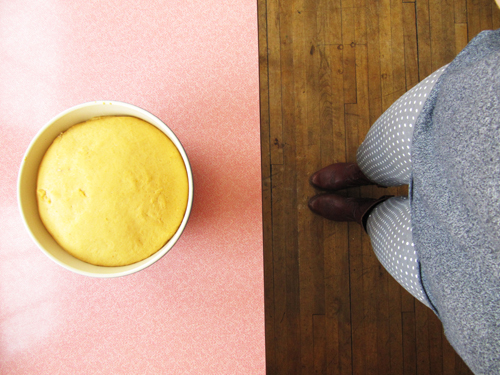 Place dough into an oiled bowl, turning once to coat entire ball of dough with oil. Cover with a towel and allow to rise until doubled in size. About 60 to 90 minutes. Divide dough in half between two greased bread pans. Tucking the sides of the dough under the center creating a domed top on the loaves. Cover with a towel and allow to rise in bread pans until almost doubled, and just peaking over the tops of the bread pans, about 45 minutes. Bake in a preheated 375 degree F oven for about 30-35 minutes. The tops will be dark and when flicked will sound hollow. Remove from the oven and pans, and cool on a wire rack until cooled completely. Store in airtight bags. Freeze second loaf if you will not be getting to it immediately. Pattern on pattern and pumpkin on pink. feeling feelings and warm bread! I’ll totes move to carbville with you. I can’t wait to be roommates! We’ll have bread for years! Yeah girl! Bake it up! Haha, I’m the same. Total carb-lover right here. 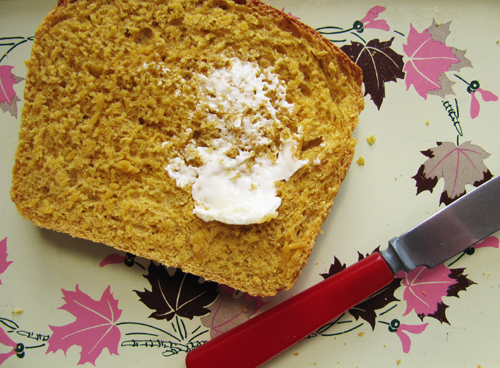 Love the idea of this pumpkin sandwich bread. I won’t be inviting my Paleo friends over any time soon. haha Yeah… 🙂 I’m glad you can relate to my bread love. Can this be adapted for my bread machine? I bet it could! I’ve never used a bread machine though. Let me know if you give it a shot. Yeah! Those sound awesome and so pretty! Fresh thyme is lovely. Ohmygosh, fresh warm bread and butter is one of the most amazing things in the world. I might admit to ripping chunks off french bread when it’s fresh at the grocery store. After I bought it, in my car. Also do you think there’s a way we can have like a Narnia setup for Carbville through a cupboard or something? It’s obvs too early for me to properly fill out comment boxes. Billy, do you know you’re my favorite? Jeez! And, yes, there will most def be a Narnia situation in Carbville. Through a pantry no doubt. Yes! I need to put some honey up on this toast, on the real. 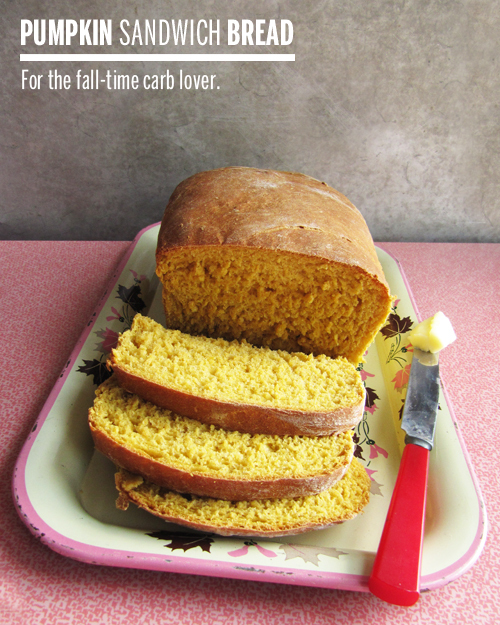 fall-time carb lover right here, and i approve! Well I guess I know what I’m doing tomorrow. 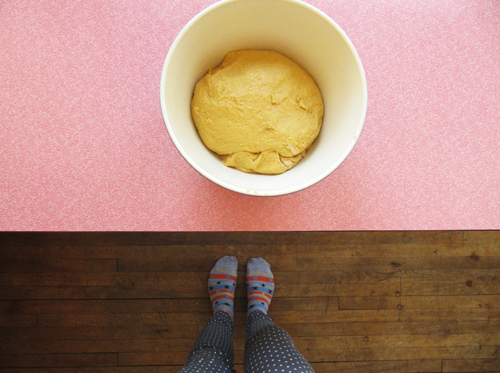 I like your leggings, and your socks, and your bread. I like you. For real! Can we not use this for a bread machine? Probably! I’ve never used a bread machine though. Let me know if you give it a shot. Bread IS awesome and I love the sound of this pumpkiny one! You know how to layer and pattern it up, too! You know how to do fall right, girl. Nicole! We need to hang out again soon. Fall-time living boozy-like with Cindy needs to happen. If only we could get dranks served in pumpkins…. This was delicious and while it was baking the house smelled wonderful too! I adapted it for the bread machine and it worked great. The best thing I did with it though was when I was making a chicken & stuffing casserole last night and used a couple leftover pieces in my stuffing. It gave the meal a nice flavor of fall with just that tiny bit of pumpkin in the dinner. You should try it! Well, now I know what I need to do for Thanksgiving! For realz. That sounds so good. Whoa. Ham and provolone grilled cheese sounds like a dream!